Recently, one of my colleagues ran into this issue when he was trying to install IIS components on Windows Server 2003. Since, I was aware of this issue, I thought of posting it for my own documentation. Whenever Service Pack is slipstreamed into the original installation source (i386), an additional file WIN51IS.SP1 is automatically created in the same directory where i386 folder resides. This file - WIN51IS.SP1 is essentially a service pack identifier file and its exact name depends on the OS version and the service pack slipstreamed into it. 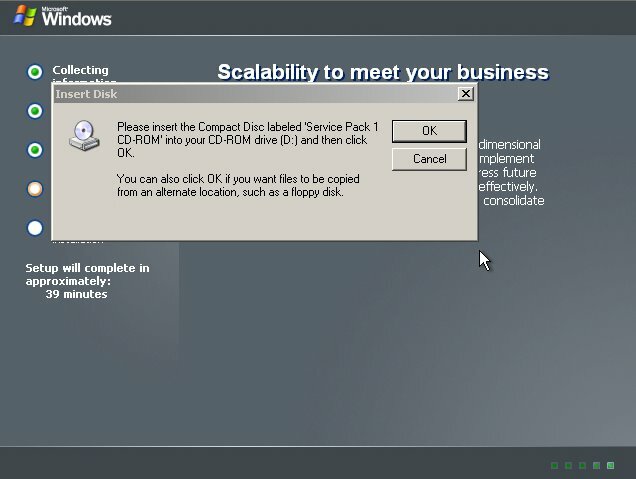 Few examples: WIN51IA.SP1 for Windows 2003 Advanced/Enterprise Server WIN51IS.SP1 for Windows 2003 Standard Server WIN51IB.SP1 for Windows 2003 Web Server The availability of this file is necessary for a successful installation if the source \i386 folder has service pack integrated into it. So, next time when you stage i386 folder on the hard disk, ensure that you also copy-paste WIN51IS.SP1 file in the same folder where i386 resides (not inside i386) to avoid any installation issues.